December is in full swing and I couldn't be more excited! Our local mountains are getting fresh dumps of snow – which means we'll be up on the slopes in no time. And, Anguel and I finally bought a car with functioning heat! We're very excited to no longer see our cold breath inside the car. Although, we're a little sad to see it go. I think we'd gotten more attached to our squeaky, heatless car than we'd like to admit. But down to business, the best part of this season is the food – and lots of it. To tell you the truth, I've been hanging onto this recipe for a while (sorry!). The first time I made these gingerbread waffles, they turned out perfectly. I was shocked. Or more accurately, I felt like the gluten free fairy godmother seriously had my back on this one – I rarely nail gluten free baking the first time! But it happened, and I was pumped. When I made them a second time and they turned out equally as awesome, I knew I had my hands on something special. I shared a quick pic on Instagram that time, but being my usual paranoid self, I held off posting the recipe until I'd tested them a few more times. 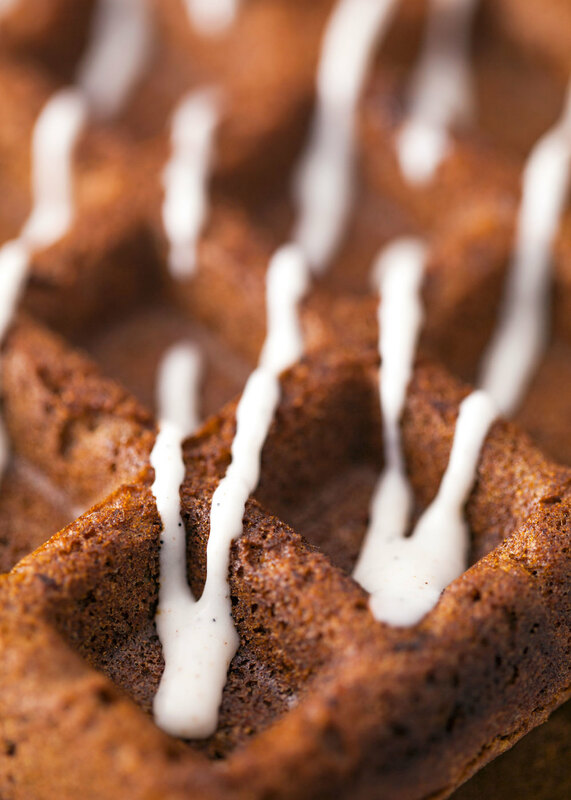 And now…drum roll please…these gluten free, vegan gingerbread waffles are finally HERE! Despite tasting remarkably like gingerbread cookies – these waffles are something to feel good about. Health-wise, you know, because that's my jam. The base for these waffles is Teff flour. Have you heard of it before? I'd seen Teff in grain form, but wasn't familiar with it as a flour until I spotted a bag on sale at the store. I'm a sucker for buying weird flours from the natural foods aisle. My collection is actually kind of embarrassing. But when recipes like this come out of it, I know any embarrassment is worth it. My first time cooking with Teff flour and color me impressed. Teff is the world's smallest grain. And I mean small. It takes about 100 – 150 grains of teff to equal one grain of wheat. Crazy, right?! Since teff's grain is so small, a large percentage of its mass is actually the bran and germ of the seed. That’s great news for you and me – because that's the good stuff we're trying to get by choosing whole grains over refined flours. Teff is also a great source of fiber, iron, magnesium, phosphorus and calcium. And most importantly, it makes awesome waffles. 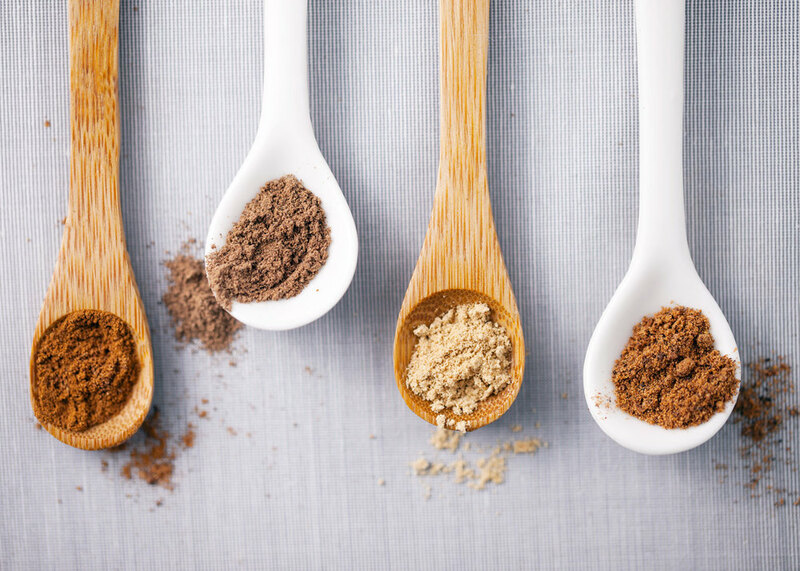 Teff is commonly used in Ethiopian cooking, but it’s also a great option if you’re looking for a nutritious grain for gluten-free baking. To me, it has ever-so-slight sweet notes that perfectly complement the molasses and gingerbread spices in this recipe. I'm smitten with this stuff. I'd imagine teff flour would also pair well with anything that has nuts in it – I'm already thinking of some teff and hazelnut combos! If you're familiar with teff, I'd love to know what you else you make with it! Thankfully, these waffles come together in a pinch – so they're still within reach on even the laziest of Sundays. I included an indulgent maple cinnamon drizzle for some extra pizzazz. Because sometimes we're fancy like that. But if you don't have a chilled can of coconut milk on hand (which you should, because it's bomb), maple syrup will more than suffice. Anguel of course prefers drizzle and maple syrup, because…why not? This recipe makes 8 individual square waffles, which is much too much for Anguel and I to cover in one sitting (as hard as we might try). Once cooled, you can pop these waffles into the freezer for later. Because there's nothing like a toasted waffle on a weekday morning. You feel so gourmet. Until your cat jumps on the counter and tries to fight you for it. But, we can all pretend. 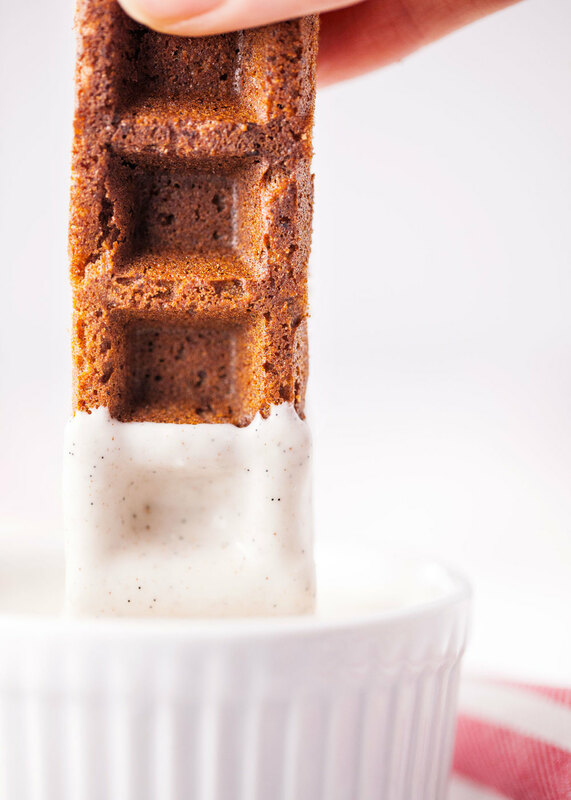 And, recent development: how about some gingerbread waffle sticks? I played around with slicing up both fresh / toasted frozen waffles into thick strips. And then, dipping them into the maple cinnamon sauce. Oh man. Dynamite. It's the perfect way to use up leftovers, or just go for it on the first shot. You'll be glad you did. In a small bowl, combine ground flax and water to make your "flax egg". Stir to combine and set aside while you assemble your other ingredients. In a large bowl, combine teff flour, baking powder, ginger, cinnamon, nutmeg, allspice and salt. Stir until evenly mixed. In a medium sized bowl, whisk together "flax egg", non-dairy milk, blackstrap molasses, melted coconut oil and coconut sugar. Add wet ingredients to dry and whisk until just combined. All the flour should be incorporated, but avoid over mixing. The batter should be fairly thick. Once your waffle iron is hot, add enough batter to fill the griddle. Since the batter is fairly thick, you may need to use a spatula to spread the batter evenly. Cook until golden brown. Take care when removing waffles - it's normal for them to be a bit on the softer side. Serve with maple cinnamon drizzle and / or maple syrup. Open the can of coconut. The thick coconut flesh / fat should have separated from the liquid. Scoop out the coconut solids, and add to the mixing bowl. Add maple syrup, vanilla beans and cinnamon. Whisk together until coconut softens slightly. 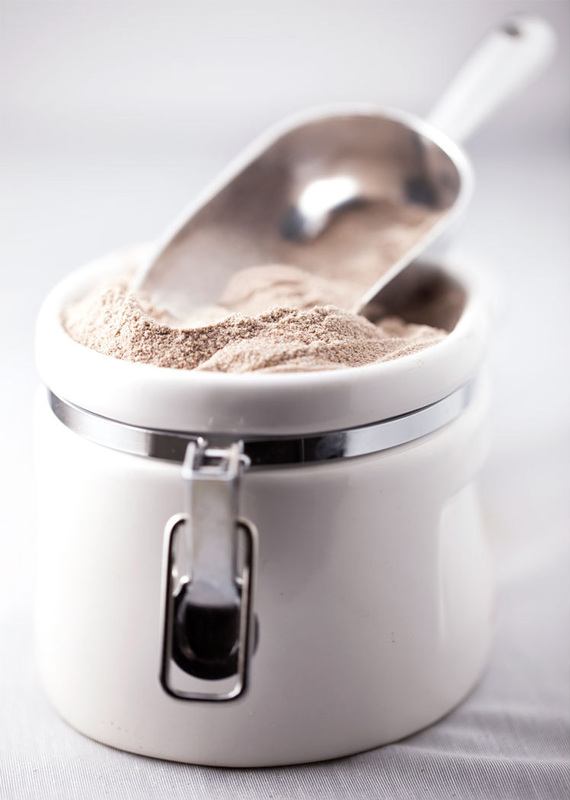 Depending on your preferred consistency, you may wish to add 1-2 tablespoons of non-dairy milk to loosen up the mixture. Store extras in the fridge. -*Ensure the non-dairy milk is unsweetened and unflavored. Room-temperature milk recommended, as cold milk may cause the coconut oil to harden upon contact. -**Opt for a full-fat can of coconut milk. Refrigerated coconut milk from a carton does not have enough fat to separate, so it won't work for the maple cinnamon drizzle. -Extra waffles can be stored in the freezer, once cooled completely.